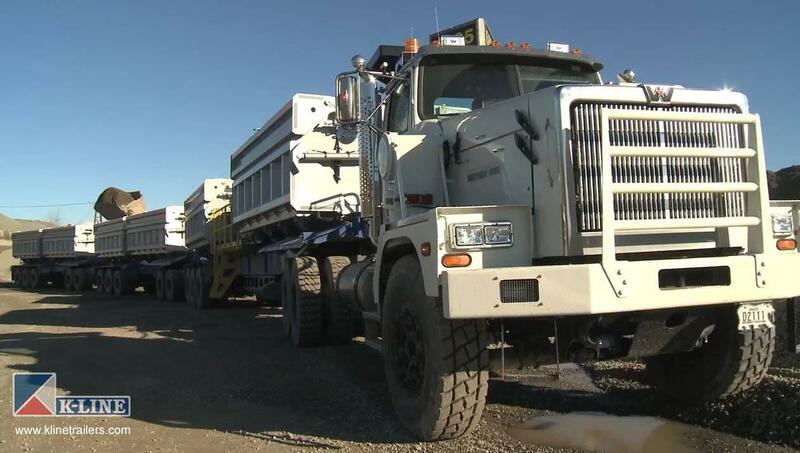 Dual Powered Road Trains "DPRT"
K-Line Trailers’ Powered, and Non-Powered Road Trains meet the increased demands of modern mines with some of the Highest Long Haul Payloads in North America, all with Reduced cost per tonne, Reduced Infrastructure, Reduced Labour Costs, and Reduced Environmental Impact. Our solution is tailored to optimise efficiency and cost at your mine. DPRTs can haul payloads of up to 400 tonnes per truck and combinations comprise of two to six trailers, depending on the application. Payload, Durability, Efficiency... are key details that K-Line will help you tackle at any busy mine site. Designed with productivity in mind without compromising dump cycle time or safety, K-Line's tough Dump Bodies have proven themselves over and over again. We can build any special mine truck body for the transport of mine overburden, rock, ore or coal, from 30 ton through 250 tons or more. For dust control and firefighting, K-Line manufactures both slip in and permanently attached tanks with a typical capacity of 30,000 gallons. Located close to the Port of Vancouver, we easily ship products and parts by road, rail, air or sea. Oversized products are first fully fabricated in our shop then shipped in economical sections for final field assembly.